Our ownership situation is still up in the air. Our star D-man (aka my fave player) was out most of the season. We had to trade one of our beloved Trinity to live within our current owner's cut-rate budget. Our franchise player has some serious shoulder surgery coming up, and will likely have to delay the wrist surgery he needed. We can only hope that Vincent Lecavalier will return strong. The Versus announcing crew for tonite's draft lottery follows sportscasting tradition by shortening our name to "The Tampa Lightning." But a silver lining emerges after a long and painful season. We. Got. Steven. Stamkos! He'll look good in a suntan, too. Well, I guess it's about that time. The season's officially over, so I suppose I should do some kind of wrap up. First off, tho, I have to mention that I was close to being right about Lecavalier's injury. I said he probably had a severe shoulder separation, and a dislocation is pretty much just that. It's too bad that he's got to have surgery on it. After seeing the replay now, I think how it happened was something of a freak thing, but maybe that's just me. However, that whole thing does make me wonder if he's still going to end up having to have surgery on his left wrist as well. Right shoulder and left wrist? I'd say that'd make for a pretty miserable off-season. Poor guy. I did listen to the game last night, and Tampa Bay seemed to have been doing well - until the third period. Again, what's plagued them all season managed to get them at the end - inconsistent play. But, what can you do? So I've been thinking it over for the last month, and I have to say that the Lightning aren't a bad team. The talent is there, the coaching is there, but things just never quite clicked. I can't tell you how many nights I've thought that this team just never got the breaks they should - whether it was a puck bounce or a penalty called. To put it simply, this team had no luck this season. Consider how the season started - with Dan Boyle's freak skate-wrist accident - to how it ended - with Vinny Lecavalier's freak shoulder separation. Boyle's own season-long experience sort of sums it up for the team, I think. It's not that they had bad luck, they just didn't have any good luck come their way at all. I expect that it'll be almost an entirely different team next season. That's unfortunate, really. I mean, Philadelphia kept their team pretty much together after their miserable season, and they did fairly well - particularly the first half of the season. Sure, Philly had a hard time of it down the stretch, but they're still in playoffs - they just peaked at the wrong time is all. Adversity usually makes for a better team in the long run, I think. But the quick fix is how things work in the NHL, so I'm sure there will be some serious trading going on this off-season for the Lightning. Not to mention the draft. Although, I have to admit that I don't keep track of prospects or the draft, so I probably won't be writing much about that kind of stuff. I prefer to deal with the "now" rather than live for the future. It's just a personal & philosophical outlook of mine. TAMPA BAY - Tampa Bay Lightning center Vincent Lecavalier will undergo surgery to repair damage to his right shoulder that was suffered when the shoulder was dislocated in the Lightning’s game Thursday night at Washington. The dislocation was reduced by the Lightning medical staff in the visiting training room with no complications. Lecavalier returned to Tampa on Friday for diagnostic studies and evaluation by Lightning team physician Dr. Ira Guttentag. It was confirmed that Lecavalier has suffered damage to the Glenoid Labrum of the right shoulder that will require surgical repair. It has been determined that the most appropriate course of action at this time is to allow the natural inflammatory process to subside in the next 7-10 days at which time the team will direct Lecavalier’s surgical and rehab process. It is expected that Lecavalier will complete a full recovery in 12-15 weeks following the surgery and it is fully expected that he will be able to resume his playing career by the time training camp opens for the 2008-09 season. Last night's game in Washington was an interesting one - to say the least. I'll give you some of what I saw, but some of it you would've just had to have been there for. I wasn't that impressed with their arena, for one. It reminded me of Nashville's, and Nashville's reminded me of a middle school gym. Still, it works, so that's all that matters, I suppose. So far, Atlanta's got the best arena that I've been to - despite the wacky seating configuration. I was impressed that the Lightning had so much jump. From what I'd gotten from the last few games, they've been rather lackluster. But they were quick, on top of pucks, and competing just as hard as Washington. The only thing that they didn't do was take shots, but that's been the way of it all season. Ramo was just outstanding. 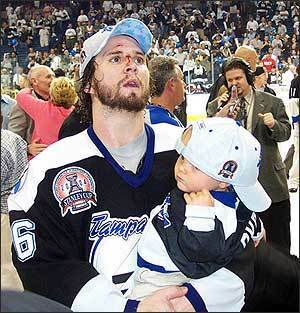 He was the best player on the ice for the Lightning by far. Sure, the Caps got 3 past him, but he did stop 37 shots in the game. It was a close and competitive game right up until - and for a good time after - Lecavalier went down. Judging from how he came off the ice, I'd guess that Lecavalier has a separated shoulder. And considering how long it took him to leave the ice after he went down, I'd say it's probably a pretty severe separation. To play hockey, you have to have a pretty high pain threshold, and Lecavalier was obviously in a lot of pain. I think it took a while for the physical shock to wear off before he could manage to get up on his feet. And for all of you who Lightning fans who think that Cooke is a menace to society, I watched Cooke play in Vancouver for years and I can tell you that he's always been that way. His hits have always been borderline illegal, and his job is an agitator - and he does it well. I'm sure he wasn't targeting Lecavalier for any particular reason other than he was just there. I saw the hit when it happened, although I'd like to take a look at a replay of it (they didn't show any replays of it in the arena), and it appeared to me as if Lecavalier was blindsided by the hit. He didn't have his head down, but he certainly didn't see Cooke coming, until maybe the last second when it was too late. I didn't see how Lecavalier hit the ice, tho, since the bench was in my way, so I have no idea how that went. You know, I really have to give it to Fedorov. He wasn't involved in the play, and I'm not even sure he was even on the ice when it happened, but he did come over to see how Lecavalier was doing. He's obviously a good guy. I was very surprised by how the Lightning did once Lecavalier did leave the ice, and it was obvious that he wasn't coming back when he did leave. The Lightning picked up the tempo and really took it to the Caps - in a clean-playing kind of way. It was pretty inevitable how the game would end up, tho. Still, to stay in the game mentally like that when your top player goes down is pretty impressive. Most teams can't do that, regardless of their records. Well, there's not a lot I have to say about tonight's 5-1 loss to Carolina that I haven't said before. So I guess I'll just leave it at that. Especially since I'll be seeing the Lightning tomorrow night in Washington. The first game I went to this season was Washington at Tampa Bay, so I felt that it was only fitting that the last game I see this season will be Tampa Bay at Washington. Funny how that works, isn't it? You could almost say it was fate. Or something. The Caps home arena, the Verizon Center, will be the 8th NHL arena that I'll have visited - if you count the Mall in Hartford when the Whaler's were still there. I've been to 7 arenas in the last 4 years, including Washington tomorrow: also Vancouver, Tampa Bay, Atlanta, Nashville, Philadelphia, & New Jersey (at the Meadowlands last season). I hope to make it to at least Pittsburgh & Carolina next season, but perhaps I'll finally catch a game at Madison Square Garden. Who knows? So have a good one, and I'll probably catch you on Friday. I've been thinking about what to write for my blog on the Lightning today, but really, Dan Boyle summed it up better than I could. Lightning defenseman Dan Boyle said Monday summed up an awful season for Tampa Bay as well. “(The season) has got to come to an end at a certain point,” Boyle said. “I think tonight symbolizes, to me, a lot of what’s happened this year where we played hard for most of the game and we don’t capitalize. (Then) the other teams score late in the third and they win the game.